REI Marina is hosting a “Get Involved!” Open House on Wednesday, October 21, 6-8:30 pm. The idea is to follow up on the community interest in public lands and seas, which we expect will be generated by this inspiring national media event. Specifically, we see this as an opportunity to invite community members to become involved in local stewardship initiatives sponsored by the many committed non-profit conservation and stewardship groups on the Monterey Peninsula. I am hoping you will be joining us! Beginning at 6 pm, local groups will be on hand to offer information and displays reflecting stewardship and conservation programs and related volunteer opportunities in our area. So far, the following local groups have agreed to participate: California State Parks, Bureau of Land Management, Monterey Bay Aquarium, Monterey Bay Marine Sanctuary/NOAA, Chuck Haugen Conservation Fund, Elkhorn Slough Foundation, Defenders of Wildlife, Return of the Natives Restoration Education Project, Save Our Shores, BETA, Ventana Wilderness Alliance, Monterey County Sheriff’s Department Search and Rescue, Monterey Regional Parks District., Stormdrain Education Alliance/Save the Whales, Surfrider Foundation. Whole Foods Market has generously offered to provide the free refreshments for the evening! At 7 pm, Pinnacles National Monument staff will be presenting a 48-minute film, “This is America” (excerpted from the Ken Burns’ documentary series.) Following this, they will show slides of Pinnacles great hikes and the natural history of the park. REI will have some sweepstakes prizes, including the DVD set of the Ken Burns documentary. A spirit of celebration of our precious public lands and seas will prevail! Attached you will find the Sending Coordinator position which the AFS Steinbeck Coast currently has open. The job can be shared by two individuals which has been done in the past. Sometimes sharing a role can make the experience more enjoyable. I had the Sending Coordinator position for several years and I’d be more than willing to meet with a grad student or employee at MIIS to help with any questions and training. Each year AFS has a training gathering and invites coordinators from throughout the United States to attend. In past years we’ve met in Portland, OR, Chicago, IL., St. Louis, MO, and Baltimore, MD. AFS pays all expenses to attend. The Recruitment Office is running a phonathon to call prospective students this coming Tuesday April 21st and we need your help! A pizza dinner and refreshments will be provided for all volunteers. PLUS you will receive either a Jamba Juice gift card or a Pete’s Coffee gift card for every hour that you volunteer. We need current students to call applicants to chat with them about the Monterey Institute and help answer any questions that they may have. 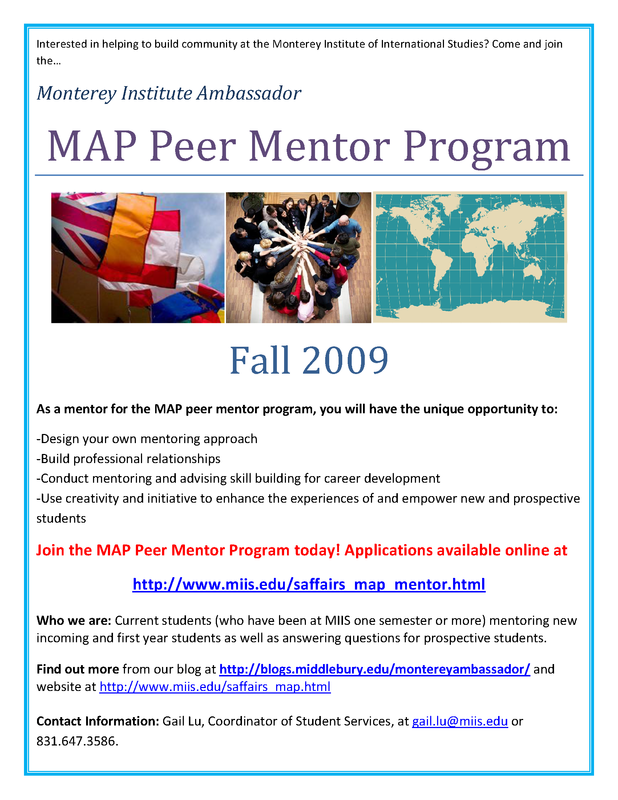 This will be a great way to share your experiences and learn about the students who are applying to the Monterey Institute. If you are interested in helping, please contact Devin Lueddeke as soon as possible by emailing him at devin.lueddeke@miis.edu or by calling 831-647-6543. Please click on the link below to nominate yourself or a friend, no later than January 31st. Elections will be held in the first week of spring semester.